When it comes to eCommerce more and more people are buying things online, and flowers are no different. If someone remembers a loved one's birthday or a service to remember a family member while they are away from their computer they should be able to order flowers from your florist eCommerce website. Many early trends were to develop apps to focus your website's capabilities onto the mobile platform. However, apps can be expensive to build and maintain, and purchasing flowers is something someone does on occasion instead of everyday. 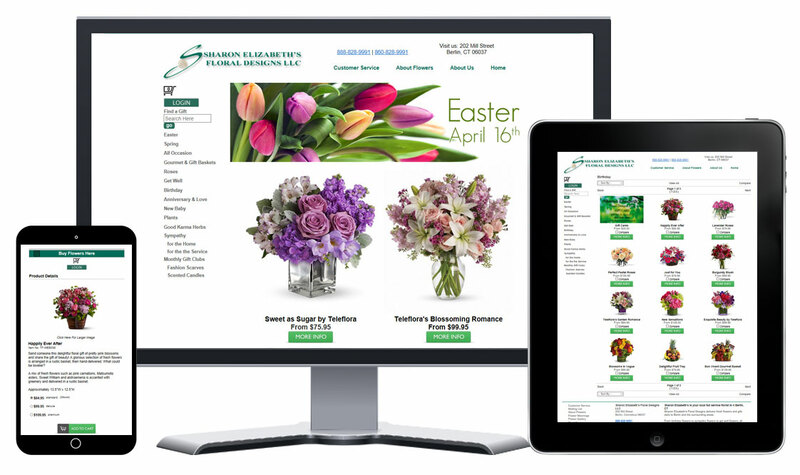 Responsive website design allows your florist's website to fit onto the screen of mobile devices, projecting your florist-related content along with the ability to order flowers onto the user's mobile device. The practice of incorporating responsive design platforms into your florist eCommerce website gives you the benefit of not having to pay a premium for an app yet still retaining the ability for customers to purchase flowers from your florist without having to install a standalone program. Your responsive florist eCommerce website with Media99 automatically adjusts to your customer's device giving them the best experience regardless of what digital media platform they use to order flowers from your flower shop. Your customers can visit your website on their laptop, tablet or smartphone and order flowers right there. There is no need to build a pricey application that then has to be hosted and updated on a regular basis. Responsive website design allows your mobile florist website to stay up to day with your desktop website without extra time, effort and money spent.